Last November 2013, the National Telecommunications Commission released its NTC Memorandum Circular No. 05-11-2013 adopting Japan’s Integrated Services Digital Broadcast-Terrestrial (ISDB-T) standard for the Philippines’ migration to digital television (TV) broadcasting. With the issuance, the regulating agency planned to finish the Implementing Rules and Regulations (IRR) in the first quarter of this year but issues on frequency allocations and channel planning prevented its completion until today. The situation makes it unlikely for the Philippines to meet its target of migrating to digital TV by 2015. Speaking of another cause of delay, NTC already issued an order in early 2010 adopting ISDB-T as the standard and released a draft IRR in July 2011, but higher authority ordered a review of Europe’s Digital Video Broadcasting-Terrestrial 2 (DVB-T2). 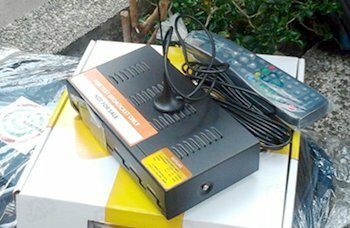 Based on other countries’ experience, NTC said migration to digital would depend on consumer acceptance, adding that, a key hurdle would be the cost of set-top boxes (see image), which will cost current owners of analog TV sets up to PH₱1,000.00 to be able to receive the digital TV signals. Also, the TV companies will have to spend large amounts of money in order to provide free on-the-air broadcasts throughout the country. Because of these, NTC is partial to allowing broadcast companies to simulcast in analog and digital to make the transition smooth. A conservative estimate to roll-out a digital TV broadcast system is at least three (3) years so the commercial operations of those companies who will be allowed to migrate to the new standard are expected by 2017 yet. However, multimedia giant ABS-CBN Corporation said it has the advantage in the roll out of digital television using the approved standard because they already invested in the impending shift a few years ago. In a press release early this year, ABS-CBN said it is ready to expand their free-to-air channel offerings by an additional five channels from the current two channels once the IRR is released. As a matter of fact, since more than one year ago, the leading TV company was giving away TV+ Digibox (a set-top digital TV signal receiver box) for free to lucky contest and raffle winners. This is a good marketing move for the company during the testing stage of their digital TV broadcasts. I was the lucky winner of a “Mahiwagang Blackbox” (TV+ Digibox) last April 28, an event that I announced in my FB Timeline. I immediately installed the unit and found little difficulty in positioning the small antenna that goes with the unit. Despite the poor signal (there are times when images freeze and screen gets blank while audio gets garbled or none at all) being received in my area, I can say that test digital broadcast intermittently gives me good television-viewing experience through better picture and sound quality. I believe good reception happens when ABS-CBN increases the transmitting power during the airing of their prime time shows. The experience should improve when commercial digital operation starts.